Happy Birthday to Oscar-winning actress (and fashionista) Diane Keaton, who turns 73 years old today. And, on this day in 1968, the Prague Spring began after a true reformer, Alexander Dubcek, was elected within the Communist party of Czechoslovakia. The liberal-minded leader started to grant additional rights to citizens—loosening restrictions on the media, speech and travel. The Soviet Union finally brought down its iron hammer to halt the democratization eight months later, invading the country with a half a million heavily-armed troops. But it wasn’t enough to stop a spirited non-violent resistance mounted throughout the country. While the Soviet military had predicted that it would take four days to subdue the country the resistance held out for eight months, and was only circumvented by diplomatic strategies. Although a new Soviet-controlled government reversed almost all of Dubček’s reforms, the Prague Spring inspired iconic civil disobedience, music and literature such as the work of Václav Havel, Karel Husa, Karel Kryl, and Milan Kundera’s novel The Unbearable Lightness of Being. 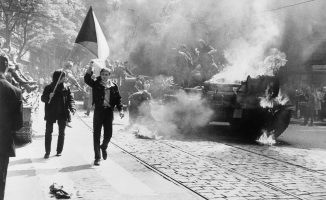 20 years later, freedoms were finally restored when the Velvet Revolution ended pro-Soviet rule peacefully.